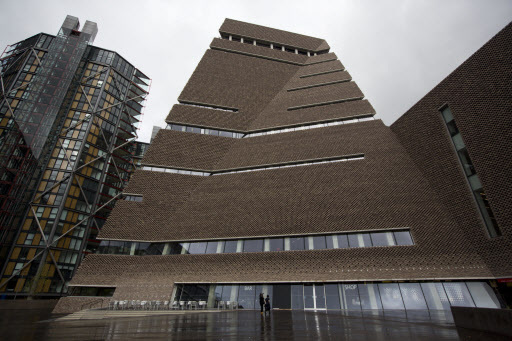 LONDON (AFP) – London’s Tate Modern museum will this week unveil a vast pyramidal extension providing extra gallery space for the millions of guests who pour through its doors each year. The modern art museum has been a roaring success since it opened in 2000, with more than 5 million people now annually visiting the former power station, whose silhouette looms over the south bank of the River Thames. This is more than twice the number of visitors originally planned, leaving gallery-goers jostling to see the latest exhibitions and requiring more floor space. Swiss architects Herzog & de Meuron, responsible for the building’s original conversion, were chosen for the new “Switch House” project, which cost 260 million pounds ($367 million). The result is a fractured pyramid of cladded bricks in keeping with the building's industrial heritage. Inside, the new space abides by the old rules, using raw concrete, rough wood and painted black metal railings. The extension was built on the top of giant underground tanks that held oil when the Tate Modern building was a power station, and which have been out of commission as gallery space since the extension works began. The ground floor, where the old tanks were located, remain pitch black but visitors will then be thrust into the daylight of the upper floors, thanks to the buildings perforated latticework of bricks, while large windows illuminate rest spaces in-between exhibitions. One of the gallery’s priorities was to stimulate visitors to ask more questions, and to encourage the exchange of ideas and thoughts between strangers. To aid this, benches and chairs have been placed in alcoves near lifts and facing the windows that open onto the panoramic terrace of the building’s 10th -- and top -- floor. “We wanted to stretch to being more environmental, providing big spaces for artists to work in performance and installation, but also more intimate spaces,” said museum chief Nicholas Serota. Switch House gives the museum 60 percent more floor space, allowing it to showcase 800 more works by 300 artists, with a focus on countries previously off the modern art map. “Over recent years, we have been working hard to transform the international collection at Tate to reflect that great art that is made all over the world,” said the museum’s Frances Morris, admitting a previous bias toward art from the United States and Western Europe. Ukraine’s Boris Mikhailov, Yayoi Kusama from Japan, Brazil’s Ricardo Basbaum and Franco-Algerian Kader Attia are all among the artist's on display. The museum has also bought more works to display by female artists, including Romanian Ana Lupas, Italian Marisa Merz and American Joan Jonas. The new building’s first temporary exhibition will be devoted to American artist Georgia O’Keeffe, whose work has often been unfairly summarized as simple flower paintings, director of exhibitions Achim Bochardt-Hume told AFP. The ground floor will welcome visitors with installations and live performances, while floors two, three and four will host themed areas exploring the relationship between objects and architecture, artists and spectators and between artistic works and the urban environment. The remaining floors house conference rooms, staff offices, shops, restaurants and cafes and the famous panoramic terrace. The museum will stage a series of events this weekend, including a choir of 500 singers led by British artist Peter Liversidge, to mark the opening.